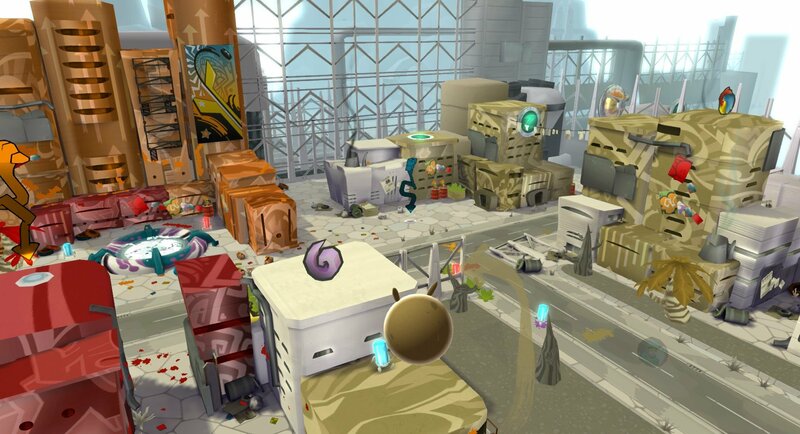 Having already been released on PS4 and Xbox One, publisher THQ Nordic is planning to bring the remastered version of de Blob to Nintendo Switch in 2018. It originally appeared on Wii in 2008, and reviewed pretty well here at Nintendo Life at the time. The new version will feature new and updated textures that take advantage of Switch's more robust hardware, but it'll still feature the same colour-coded platforming gameplay that made the original version so enjoyable back on Wii. If you've never played it before, you're tasked with saving Chroma City from a black and white fate by painting this urbanised locale in all manner of colours. There's a story mode as well as support for four-player split screen local multiplayer with eight different modes. Painting by numbers is an apt phrase for this and many games on Switch. I have it and the sequel on Wii. Doubt I'll buy it again. But for those new to it, it's a good game. Hope the price is reflective of its age. I had good fun with this game but don't need to buy it again. I remember this game not really being all that amazing. Played it on Wii. No interest in playing it again. Yes! And pack it with the second! Flippen loved this on Wii, my kids played it on Wii U too in Wii Mode, they'll be very pleased to see it on Switch I imagine. Should have been the second one or a combo of both. @SLIGEACH_EIRE But this is a portable 1080p HD remaster, and you're supporting THQ Nordic to port more games to the Switch if you buy it. played it on wii. really liked it but never finished it i think. the only downside is that you always have a timer running so it kinda takes away a lot of the feeling of freeding you would normally get from the levels. that always bothered me. Didn't like this game very much. I'll pass. @AlphaJaguar I want new games. The Switch may be a PORTable but I'm fatigued with the amount of ports I see. They're taking the proverbial P. And I don't mean THQ Nordic(who I very much respect), I mean everyone's at it. Guess I’m buying this for nostalgia factor alone. Lol. @SLIGEACH_EIRE - Unless it's exclusive. It will be a port. I'm down. I never gave the series a go in the Wii/XB360 days. I have this on Wii, it's really not that much fun. @Paraka You know what I mean. Not 10 year old games like this. Considering it's $20 on other platforms, I'm hoping they do a dual pack De Blob 1&2 for $40. You should easily be able to fit two wii games on a single cartridge. is it also a problem on the ps4/xb1 or just the switch? @SLIGEACH_EIRE - well 10 years is enough to consider what can be done to "remaster" a release. Doubt much can be done with this game in particular, but THQ Nordiq isn't much of a hefty company to begin with. The only in-house development they have currently is Darksiders 3, and a few small indie publishings. Outside that it's port-mania to make funds. This isn't exclusively to the Switch, either. @AlphaJaguar Supporting the developer is a pretty weak reason to buy the game if you don't genuinely want it. @sword_9mm If it's a problem on PS4/XB1, does that somehow make it OK on Switch so? I've been interested in this game for a long time but never ended up buying it. I guess I have an option to buy it for Switch instead. Depends on the price. I can get the Wii version for under 10€ so I'm not really interested in paying more than 20€. I'm perfectly fine with an older version. I haven't played this game in years. This and TWEWY are double dips for me, without question. What's crazy is now De Blob and TWEWY will be on the same Nintendo device a decade after both games initially released. How times have changed, and I love it. Never played it, so I'm all in. Was wondering why it wasn't announced for Switch with the other versions. But apparently they were already in mid-development. Seems to be the case for alot of games. By the end of 2018 though, many full development cycles will have started with Switch from the get go. Ah, I LOVED this game and the sequel! Rolling around, coloring everything that I could, even for just the smallest amount of points-this was Splatoon before Splatoon was a thing It's been years since I played it, so I think the novelty should reappear. Hopefully they bring back the motion controls of the Wii version-call me nostalgic, but it was a nice feature of the game. I recall it being simple, like Mario Galaxy, in which it was pretty much just shake and jump, and it would be a nice callback if they took the time to adapted that into this version. i remember when splatoon was announced. people were saying that it was jsut deblob. it's all jsut come around, hasn't it? YES!!! I was commenting to a mate about how this would be perfect for Nintendo audiences at the time it was being announced for XB1/PS4. I only played the sequel on the 360 (which I assume will be coming to Switch too), so I'll be grabbing this. dB2 has one of the best game soundtracks ever - looking forward to hearing the original. It best be 60fps though. I'm not going to buy this a second time but I definitely recommend it to those who haven't played it. I keep meaning to get the sequel but haven't done yet, so if that gets ported to Switch too I'll probably buy it. All this time they could've made a 3DS version of this game but nope. Laziness galore once again. This game surprised me time and again with the production quality of the animated vignettes. Very cute characters and superb animation and editing. A new peak in idiocy today, moaners complaining about games they never had the intention to buy in the first place and thinking that ports take away development time from new games. Unexpected, but welcome news!! I’ll be getting it just to support the company since I loved it back in the Wii days. I thought the music was simply inspired. And the second one? I think my copy is in shrink wrap so i might get this digital. @KirbyTheVampire You could say it was a "Poor man's splatoon"
Would probably buy if a sale comes around. I’d want to play both again so I hope both are coming eventually. @JaxonH de Blob isn't coming to PS4 and Xbox One, that's de Blob 2. PS4 and Xbox get the second game this month, and the Switch gets the first game later this year. Cool. I played a demo of this on the PC and it seemed pretty decent. Might give it a crack now. Love this game! If it comes in at not-full-price I will definitely get a copy to play again. 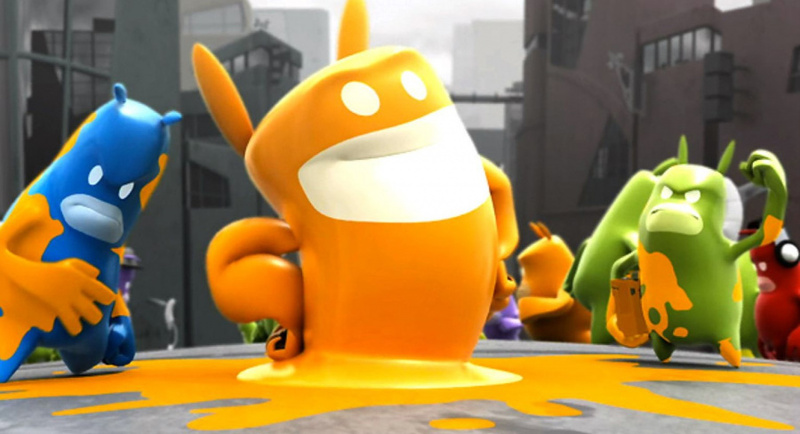 I miss de Blob. This would have to be pretty cheap for me to consider a purchase. Shame it doesn't include the original, too. @JaxonH DeBlob was pretty good and fun, should look good in HD too. The one thing I wasn't a huge fan of was the Wiimote motion control, which I think they removed in the 2nd when it came to the other condoles. The motion was a flick to jump. Only you didn't flick up to jump you flicked fown, like you were hitting him on the head to bounce him. Took me a few hours to catch on. That wouldn't work too we'll in handheld mode either way. But it's a fun story, what story there was, it's actually similar to the single player in Splatoon 1 but much more open (still haven't played 2 so I don't know what that's like.) I wonder if @sinalefa ever played it, he talked me into a Wii U indie game which was similar, only without the pain that aspect. Oh, off topic, just spent 50 minutes on the phone with the cable company, haven't pulled the trigger yet. Do you think 20Mbps is fast enough? It's $30 for 20M or 100M for $75. $75 seems like a lot to me, stupid $10 modem rental fee. For $23 more I get phone and basic btoadcast cable, $98. Me, I'd go for the 100mbps. But 20mbps is perfectly adequate. Pretty sure it's more than adequate for you, in fact. Ya, you're good with 20. Finally, an end to all those Wii U ports. @SLIGEACH_EIRE We know you are fatigued with games ported to the Nintendo Switch portable console. As we say in my country - even ants behind rocks know it. I watch 1080p video and game just fine on 10Mbps. 20Mbps is more than enough. @rjejr $98? I've got the whole package for €70: Internet (100 Mbps), a home phone and an Interactive TV set top box with basic AND extended channel package, HD TV and recording. I'd never go back to a lower bandwidth. That's not sufficient for streaming and gaming, at least not over here. And the modem is included in the package. @Cosats I’m still waiting for him to explain why it’s easier to port Steamworld Dig 2 on the Wii U rather than the 3DS. Appears to have a lot of opinions masquerading as facts, without much knowledge to back them up. Also seems to forget there are people that, for whatever reason, didn’t own a Wii or Wii U so these remastered ports will be new games to them. 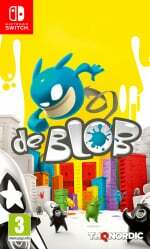 Personally, I think de Blob, it’s sequel and the DS version were all great games. Happily double dip if the price is right. huh? you were saying too many ports on switch. this game is getting a port on the ps4/xb1. is that also an issue to you? you can't have it both ways. be against all ports to all systems or not. don't just single out the switch. i'm not seeing a great wash of new games announced for anything so not sure why you're so up in arms about ports coming to the switch; unless you are the same way on sony/ms boards. @AlphaJaguar I can't use the second part of your reasoning as an excuse to buy anymore, too many ports. If they want my money they're going to have to bring something interesting to the table like every other market. I'll get it when it goes on sale. It looks fun, but I'm in no rush to get it. I understand and agree, but I'm also glad there are so many ports because it gives me personally a chance to play games I either skipped because of various reasons, or couldn't play because they weren't on Nintendo consoles, like DKC: Tropical Freeze, Rocket League, VVVVVV, Stardew Valley, SteamWorld Dig/Heist... It also gives me a chance to double dip on games I love, like Shovel Knight and Mario Kart 8. However, I agree that companies should be generating new content alongside the ports, instead of being happy with shoveling their entire library onto the Switch. Awesome! This was one of my favourite 3rd party titles on Wii and I never finished it, so I'm more than happy to do that this time. My kids love those games. This will be a must buy for them. This is frigging wonderful news. deBlob remains to be not only one of my favorite Wii titles, but it is one of my favorite games, period. "i'm not seeing a great wash of new games announced for anything"
Of course not. The vast majority of games on every system ever are ports and multiplats, and exclusives are getting rarer and rarer beyond what the platform holder pays for. They just don't make financial sense. @SLIGEACH_EIRE its being remastered so there is a good chance they will price it as shiny and new because of that. @Julien Do you've any idea how many notifications a day I get? I can't respond to every one of them. It's easier to make a Wii U port than a 3DS port because the Switch is a trumped up Wii U. Whereas they have to downgrade the game for the 3DS. "Also seems to forget there are people that, for whatever reason, didn’t own a Wii or Wii U so these remastered ports will be new games to them." Unless you were too young or didn't have the financial means, you've no excuse for not getting most of these games. @ThanosReXXX Isn't 70Euro about $98 though, or is that Pounds? Close enough. Prices were better before December when Altice put it's new ownership into full swing. $5 cable modem rental, I've had that thing for years w/ no fee, the same one. It's actually $10 now, I'm grandfathered in. $7 sports fee on the $65 package that includes sports. Plus $4 fee for local channels, so the $65 package is really $76. They raise the fees each year so they can advertise the package price is still the same. Even the $20 local channels only package - which I get w/ an antenna - has the $4 fee added on. For free over-the-air channels. $10 box rental goes up about a year as well. Their new all-in-1 box is $20 I think, but I don't like all-in-one, rather have separate proven tech. @burninmylight 10Mbps? They don't even offer that one any more. What's crazy is I found their big ad push from years back when they were pushing 20 as thee next big thing, even had it's own name at an expensive price, "Boost". I think I had 5Mbps back then and didn't want to pay the extra, 5 was fine. That was before 1080p HD streaming though, Netflix still had discs. I remember going up to 10 from 5, then 25 which was huge and more than I thought I'd ever need. Now 20 is the bottom. 400 is the top. I've had 50 and 60 also, which was insane to me. I've got 100 now but can't really tell the difference between that and 50/60, I'm running 2 routers in my house, probably slowing everything down a bit. @JaxonH is right about me really only needing 20, it just sounds so small. But no 4k tv means 20 should be fine. I'd prefer 50 for $35 to feel safe, but its' either $30 for 20 or $75 for 100, so 20 it is. Thanks guys. I'll probably go w/ the 20Mbps for $30, spend $25 on Sling and live w/o the home phone nobody uses anyway. Better than $150. Sorry for derailing the thread, but it's another port thread, I think it was already destined to be derailed from the get go. Cool, missed it the first time around, might give it a go this time. Played this on wii, it was alright. I'd be interested to try it again as an adult, as my memory's foggy on it. Here's hoping it's a budget release, not about to drop more than twenty or so on this one. @gortsi And then you've got the idiots complaining about the people complaining about ports, instead of focusing on the overwhelming amount of supportive comments. Funny how that works, right? @G_M nah, not here dog. You part of the troll squad too? @G_M Sorry I just realised you're one of those who comment on a Nintendo-centric website and unironically use words like NDF. Do me a favor, go talk to like-minded trolls like the Irish wacko and leave the rest of the comment section to adults. Cheers. So I just ordered my $18.99 cable modem, so my home phone number is as good as gone. Now it's just a matter of 20 or 100, and maybe local channels, but probably just the Internet. Wife hasn't made her mind up yet. I couldn't think of any other translation fitting the bill. The Dutch name literally translates to "garden house", but that didn't seem quite right. It's a small, wooden, one bedroom vacation house situated on a community complex on the outskirts of the city right next to farmland. So, it's a location that's still in the city, but to the senses still enough apart of it to feel like a real holiday location. Darksiders 1 and 2 are bound to be coming soon. It was a great game on the Wii and I played it a lot with my daughter. I highly doubt I will purchase this one just because it's on the Switch. Ok, not going to lie, this brought a big smile to my face. The Wii game was amazing. The sequel was awful, but the original exclusive was a gem. @Kalmaro Don't get me wrong Nintendo has had a moderate amount of support but the big name companies that have pledged support... 80% of them have released bull no one wants or nothing at all. @SLIGEACH_EIRE Ports aren’t a problem. Not on the Switch, not on any other console. Ports are good business wise and help introduce new audiences to the game in addition to the occasional double dip. Just remember that NOT everyone has already played all those ported games before. I also want new games (specially interesting and exclusive new IPs) but I hope the ports keep coming. And now that they’re at it, where are the Darksiders 1 and 2 ports I’ve been waiting for? Been discussing this with a few friends, surprised of how well this game was and yet no one I know who owned a Wii had the privileged to play or own this game. But, they also make the connotation to Splatoon. Literally everyone does. Which makes the question; Wouldn't it be in THQ's best interest to capitalize? Like, make an Inkopolis inspired map (where everyone in the game are "fans" of the series) and the game uses the music to come to life from Pearl and Marina? Great game. I hope it has a MUCH better save system this time around though. Yeeees! I had this game on my Wii when I was around 8 years old and I loved it! So glad they're bringing it to Switch! This is a brilliant game. This makes me hopeful for an HD remake of Skyward Sword. The HD rumble could take that game to a whole new level. All right! I played this back when I was (censored) years old when I was in (educational system)! I'm happy to double dip. I hope they bring the second game over too, though I didn't like it as much as the first. Either way both would be insta-buys. Ports are fantastic, bring on the ports. They indicate the Switch is healthy. 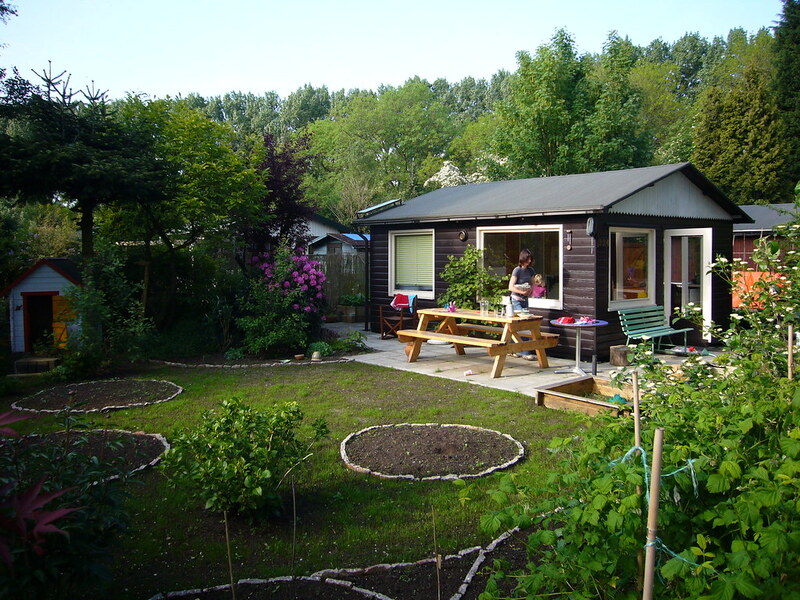 @ThanosReXXX I like garden cottage, and it is a garden cottage, so nothing wrong with that. I'm not sure what else to call it. You gotta admit, it does sound very British Royalty though (everything sounds British Royalty to me, too much Dr. Who, and I'm watching Secret Diary of a Call Girl b/c Billy Piper). It's where you meet the Queen for tea. Not Trump though, he's banned. @Grumblevolcano "Darksiders 1 and 2 are bound to be coming soon." I kind of fell like they already were, as Wii U got the Warmastered one and PS4 PS+ just got 2 for free. I'm easily confused. Is 3 coming to Switch? I'll guess no, I think I would have remembered that. @TheLobster Nice judicious use of parenthesis. Well I am intrigued. A 3rd party platformer not designed to look like something from the NES or SNES! I don't mind that it is a remaster at all, and how many of you would have even known it was a remaster if this article didn't tell you? Apparently de Blob 2 on PS3 can be run in 3D mode. That's the version that interests me the most if I want to go there. This and its sequel are some of my favorite games of all time. Played the 1st game on the Wii, and the 2nd game on the 360. Don't have a Switch yet, but will definitely be double-dipping when I do get a Switch. I'm really hoping this means that there is a studio working on a new game. @rjejr Reading this comment section made me feel a bit... on the older side of things! @6ch6ris6 reminds me a bit of the older Tony Hawk games in that way. That said I always wanted freedom to explore in those, and when the games came out that allowed it I regretted it hard so a timer can be a good thing at times. Unrelated to reply, I loved this game on Wii - it would definitely benefit from an HD touching up (look pretty good even), and I don't mind the improved control scheme either (you know what I mean). I remember how the music built up while playing through a level, and all colours adding different instruments to it. Advancing in one of the huge levels just made me feel... Festive? This is by no means a complete list, just the most notable ones. These remasters were especially prevalent in the early days of those two consoles, filling out the release schedules until more new games were finished. Hopefully this is the same for Switch. @6ch6ris6 I mean, it makes it feel rewarding to complete blocks, those citizens drop timers right and that's supposed to be some mario star tier reward, has got to matter to you somehow. If you play at a decent pace that timer will never sorta threaten you. Exception right, when you get lost - start backtracking or aren't entirely sure what to do suddenly the pressure builds. I keep a block ready (all but one building painted) so I can save myself. the end credits with us? and like damn. all my work deleted, start over day one. By the way: I did look up Garden House, but most of them looked like complete houses, concrete designer bungalows for the rich and spoiled, instead of a small holiday cabin for the average Joe, which is why I chose "cottage" instead. Just give us Darksiders on Switch please. I need those games on the go. @WhoaManWtF All THQ Nordic games are released on Steam first, so by that definition, they port all of their games. "Unless you were too young or didn't have the financial means"....well, chances are that's a lot of people given its a 10-year-old game. The potential audience for this is people who were too young, people who missed out on it for whatever reason (finance, not having a Wii, not fancying the game at the time etc) and people who might double dip for a portable/HD version i.e. lots of people. A big audience for a game that doesn't require as much time effort and money to develop as a new game. That's why the library of every system ever, certainly post-NES, is dominated by ports and multiplats. "A big audience for a game that doesn't require as much time effort and money to develop as a new game." And yet they more often than not charge full price for these ports despite their age and lack of development costs. @TheLobster I've felt like that for 8 years on here. And also every moment of my life for at least the last 12. New Kermit avatar is supposed to cheer me up. Seeing yours again actually reminded me to change mine. And you know you're already dating yourself w/ that, if you want to come across younger you need Rick & Morty or Adventure Time. @ThanosReXXX I only like Piper b/c of her 4 seasons as Rose Tyler on Dr. Who. If you ever have about 50 hours to kill I'd recommend the first 4 seasons of that show. It drops off alot after that. Then a whole lot more after that. But those first 4 seasons really toe together nicely at the end. Normally big lipped blondes aren't my type though, I do prefer the Goth fluzzies. Blame Death. @rjejr I don't like Rick and Morty or Adventure Time though. Which dates me right there. Steven Universe is good though. So is Gravity Falls. @rjejr "You get what everyone gets. You get one lifetime." But to each their own, I guess. Personally, I only like modest application of tattoos and/or piercings. I like women to show their natural beauty, unspoiled by ink sleeves and dozens of metal rings. Same as with other over-exaggerated body modifications, such as too much plastic surgery or breast "enhancement". It literally disgusts me. As for Dr. Who: I don't have 50 hours to kill, but fortunately, this is a case of preaching to the choir, my friend. I've seen every Dr. Who season up til the most recent one. We used to have Syfy over here, but Universal, the owners of that channel, apparently couldn't make enough money in the Benelux, so they pulled the plug on their channel here. That is why the last season I've seen, is the one with Matt Smith, haven't seen any of the Peter Capaldi episodes yet. I am simultaneously wondering what was so special to you about Piper in Dr. Who. The role was more than fine, although she did look rather plain in it. Not like in Diary of a Call Girl, and if you want to see yet another series with her, then you might want to check out Penny Dreadful as well. Funny thing is, that most people outside of the UK who know her, will probably only know her from those series, while she is actually a singer/dancer first, and only started acting later on. But if I had to choose my favorite Dr. Who actresses/babes, then it would probably be Karen Gillan and Jenna Coleman. The first one is crazy as hell in real life, so a lot of fun to go out with, and the second one is just cute as a button. As for having a type, though: I don't really have one. I used to think so when I was in my early twenties, but history has proven me wrong time and time again. I've had all kinds of types, shapes, sizes and ethnicities, and I had a great time with all of them, some more than others. So, nowadays, I just go for chemistry and charisma, something that isn't limited to a certain mental picture of what might attract me physically, because if I'd ignore someone based upon not being able to check off all the items on the ""what my type is supposed to look like" list, I might just miss that person that I could really click with for a whole lot of other and probably better reasons. I never played any De Blob game. I dont think it was acommodating to colour blinds so I skipped it. @sinalefa Yeah, I imagine that would be a huge impediment to playing that game. @TheLobster "You get what everyone gets. You get one lifetime." I don't watch and really can't stand the look of any of those shows, Uncle Jr, Gumball (those may not be actual shows). Closest I come is Phineas and Ferb and Teen Titans Go, but those are pretty mainstream looking and tame compared to some of that insanity. I was watching some cartoon the other day that looked like a cross between Rugrats and Fat Albert, if every kid on those shows was shooting up. So stick with Calvin & Hobbes. Do you know Bloom County and Outland? That's about as crazy as I get in cartoons. @ThanosReXXX Everything gets lost in translation with us, but somehow we persevere. You aren't missing much w/ Calpaldi, none of us liked him, and even though "Souffle girl" is by far the most beautiful of all the women to appear on that show, she and the old man just never connected. Ive considered watching the Crown b/c of her but haven't gotten around to it yet. Watched Penny Dreadful on my dad's recommendation of all people. Was really good but they rushed the ending. Eva Green had my full attention in that one though, she was practically playing Death. Don't think Death really started me down that dark path though, pretty sure Winona Ryder in Beetlejuice was first, Death was just the mountaintop. I had an unfortunate crush on a blonde in my teen years, too many years, so much bad emotion, even attractive ones I can't like, I'm scared for life. @rjejr I do! Though as you can tell I'm more of a Calvin and Hobbes/Far Side kinda gal. As for the saying: it's not an exact translation, but it's more along the lines of "beauty is only skin deep". The Dutch saying, as do most, comes from history. Back in the old days, as in 1700's - 1800's, the average Joe only had tin or wooden plates to eat from, so these were functional plates. Only the rich and famous had fancy porcelain plates and what not, and the average (poor) people could only stare in admiration at all that exaggerated diner gear, and ultimately, they decided that it was pretty to look at, but they wouldn't dare to eat from it, so they'd only keep it to hang it on a wall or whatever. @TheLobster The Far Side? Wow, now you're really dating yourself. (I had to look up to see if it was still around, I didn't think it was, I recalled it being replaced w/ "Rhymes With Orange". Doonesbury, Dilbert and For Better or Worse, a collection of which sits on my shelf. Can't believe Far Side stopped in 1995. That can't be right, that's during my previous life. Oh, I did find a new cartoon I can tolerate, Unikitty. I won't seek it out, but I'll stop channel surfing if it's on. Since you knew that Gaiman quote I'm guessing you know Sandman. I always thought this Bloom Country cover was an ode to Sandman, though it's probably just Shakespeare. OK, got a bit carried way there, sorry. @ThanosReXXX "Which is why it is said that business men wear neckties, to keep the blood where it is supposed to be..."
Funny, I just had the necktie conversation w/ my sons - we had to wear them to a couple of bar mitzvah's and of course they hated it. I told them neckties were worn by men to go to work to remind them that they were in the noose of slavery and while they were at work their masters owned them and when they got home they could take off their ties and do what they wanted. I like your story, but I'm sticking with mine for historical accuracy. I may be wrong, but that's how I see it anyway. I'm calling that last paragraph on topic as the title is "Switch gets a new lick of paint". @rjejr Tsss... you're really giving blondes the short end of the stick there. Not saying I'm a blondes man, seeing as I have no designated type, but I certainly don't ignore them by default. None are the same, so except for the hair color, they could completely be anyone's type. Your supposed history about the necktie is quite a bit gloomier than mine, and I wonder where you got that from, or if it's just your dark humor as opposed to my rather more sexually orientated humor. Anyway, I obviously never took the "keep the blood were it needs to be" statement seriously, but it is an office joke, and me being in the business I'm in, I've worn my fair share of neckties. On a personal level, I can even agree with your made up explanation, since I always felt choked/stifled when wearing one, so nowadays, I don't wear them anymore, except for on weddings and funerals. Is it Kermit's birthday, or what? Or did something else prompt the umpteenth change of your avatar? @ThanosReXXX "you're really giving blondes the short end of the stick there"
It's not intentional, I know blondes can be attractive. But have you ever eaten something that was supposed to be great but it made you ill so now you just can't even think of putting it in your mouth? I'm that way w/ tequila. I'll do a shot of almost any liqueur you put in front of me, but no tequila. I just won't. Blondes are my tequila. "Yet men all around the world, myself included, love wearing them." I'm pretty sure I don't know 1 single person, not even you, who LOVES wearing neckties. And man is actual history boring, I'll take either of our explanations over boring ole history. Avatar change was my attempt at self medication as I await the arrival of spring. I've always been a huge Kermit fan since I was a kid - helps that Sesame Street started when I was 4. He had quite the personally for a frog puppet. He sang about being green, he was a roving reporter. He could do it all. Except make his way to the Sesame Place theme park, he's band from there. Anyway thinking about the upcoming Mario movie I was thinking they should make a buddy movie w/ Mario & Luigi traveling around the Super Mario Odyssey game world like the Muppet Movie (all time great classic). Also changed his singing here - Rainbow Connection - to my phone ringtone. Which I have to hear a lot now that I've done away w/ our home phone. No cable TV either, just got back form returning the 2 boxes. I'm so 2018. Though I won't call myself a cord cutter as we need the internet cord, but I know other people do. @rjejr Yes I love Sandman, as you obviously guessed. I'm not much of a comics person (or is it a "graphic novel?") but I blew through the whole thing in about a month when I found it in my early 20s. Well I say I'm not much of a comics person but I'm actually a bit of a NEWSPAPER comics person. Or I was in the 90s when they were still relevant. We haven't had the newspaper delivered to our house for the better part of a decade now. It's just not worth it here. But I LOVED Calvin and Hobbes (natch), Foxtrot, Baby Blues, Zits, Beetle Bailey, Blondie, and as you mentioned Dilbert, Doonesbury, FBoFW. There was a great blog I used to follow, don't know if he's still around, The Comics Curmudgeon. Very funny guy. Used to tear into Family Circus, et al so hard I would just about cry laughing. I should look him up again. @rjejr "And man is actual history boring"
Yeah... in this case, I can do nothing but wholeheartedly agree, but then again: it's about neckties, which part exactly did you think was going to be interesting or exciting about that? Technically, I also don't have cable anymore, for about 5 years now already. My set top box (kind of a misnomer, since it actually sits underneath my TV) has a wired internet connection, and TV broadcasts are streamed in that way, but I still get all the regular channels except in HD. Cable over here is non-HD, same as over the air, but most people already have what we call iTV (interactive or internet TV). We could definitely use some more Kermit songs right now, though. Definitely better than (even though I'm miles away) once again feeling a healthy dose of embarrassment (for my fellow countrymen) because of the latest high school shooting, and the dumb, uneducated and short-sighted reactions that pro-gun people are giving concerning this latest tragedy. That's both one of the benefits and curses of modern day technology: I can still follow everything happening in the US as if I was still living there. Right now, I'm really glad I'm over here. No gun-toting idiots over here, and far stricter regulations for possession and usage, which basically means only allowed on the shooting range. The darker side in me (how much darker than Thanos can one get?) still hopes that an enormous tragedy is going to happen to a large portion of the people running the NRA, so they can finally feel the pain themselves, instead of innocent kids who are just trying to finish their school to get their diplomas and start an actual adult life, and now theirs has been cut short WAY before their time. But I'm afraid "we" will never learn. I wonder what our ancestors would have thought of it when they wrote down the part about the right to bear arms. I still firmly believe that in their minds, it was strictly meant for times of war, not in times of piece or every day life, and obviously, their point of view and mindset was completely different from ours. Ugh... I should probably let this one go. Not like I can do anything about it, and it certainly doesn't do anything to lighten my mood. I'm already sorry I brought it up, but seeing as it is all over the news, even here, I can hardly avoid it. @ThanosReXXX I'm trying to avoid it all myself, I have 2 kids in school, I need to sleep at night. And as much as I agree w/ you on the topic, and since I was so bored by necktie history, I do think the "founding fathers" intended for people not only to have guns in times of war but also in other times as well. In 1776 probably half the country was still hunting, whether as trappers selling their kill or frontier folk eating rabbits, a musket I think was part of life, a farmer would be naked w/o one. Also needed to fight off "injuns" and the occasional brown or black bear, or a wolf or coyote. I can't imagine living in the wilderness in 1776 w/o a rifle, I'd all assume they knew that back then as well. Of course bears are mostly in zoos now, wolves in Yellowstone park, and most people don't hunt for any reason. And if your using a semi-automatic rifle to hunt, well I'm a city slicker but even I can tell you you're doing it wrong. And there are still a lot of people I know who hunt. And my uncle and his family of butchers made some decent money carving up deer for the hunters back in the day. So I do think some of that still holds. 2 of my 3 brother-in-laws hunt, one with his brother and father, the other teaches his kids, son and 2 daughters, proper respect for a hunting rifle. And as opposed as I am to killing defenseless animals b/c I'm a bleeding heart liberal, well I'm also a fisherman, and I kill a lot of what I eat and don't eat, so I can't judge them and be hypocritical that way. That said, it's out of control, and something has to be done. I can't recall the last massacre w/ a hunting rifle or shotgun, everyone uses semi-automatics these days. So I think that's a good place to start. I had to take a written and driving test to get a drivers license, that's another place to start, gun safety. Not just a background check, a test and license. Renewed every year. Of course nobody in the deep South is going to give a license to a non-white, and nobody in the US is going to give one to a non-christian, so bias is an issue that needs to be covered as well. But they need to at least give the appearance of doing something besides praying. Make the effort. Sell bullets like beer. Besides guns how do these people get so much ammo? They aren't growing bullets in their yard. So no, I don't have all the answer, or any answers, but I'd like somebody to at least seriously start discussing stuff rather than just taking in millions of $ each year form the NRA. Better than discussing boxes of food for the poor, pretty damn near the stupidest idea I've ever heard. Even if we don't shot every kid in the country to death, the plan is to starve them to death. "And no cable TV anymore?" No cable boxes or paid for channels right now. Lots of "over-the-top (is OTT a thing there, I know you hate when I use abbreviations) options. so I wont' know the speed until they flip the switch, which they still haven't yet, I still have a dial-tone on my phone. Basic used to be 5, then 10, then 15, then 20, some people online in the forums say 25. They used to sell 20 as "Boost" for as extra $5 per month back when 5 was their main, about 3 years ago, so it's not like I'm going back to dial-up, I'm going back to "Boost", which I never paid for b/c/ 5 seemed like enough to me. 20 should be fine if I get it and it works, no throttling. I'll let ya know, whether you want me to or not. @TheLobster Thanks for Zits, I was thinking of it but couldn't remember what it was called, not even enough to Google it. I stopped my paper delivery service a few months ago after I realized the price had gone up about 50% in 2 years. Auto bill every 8 weeks on the credit card some of it snuck by me, but I finally realized it was too much. I'd actually mostly stopped reading comics a couple of years ago though, The Lockhorns kept having the same convo over and over again. Only Doonesbury and Baby Blues. I started Sandman around mid-run, my friend turned me onto it. I caught up quick and stayed until the end. Read a few other Vertigo comics, Shade the Changing Man was my favorite, and some other Dark Horse stuff, but I was mostly a Marvel superhero guy. So long ago. My teen son is reading my Marvel collection these days, I haven't given him the heavy stuff yet, baby steps. Almost related to Sandman, there was a show called Constatine a couple of years ago based on the Constantine comic of the same name around the same time as Sandman, not to be confused w/ the Keanu Reeves Constantine movie. It's available free on CW Seed now. It was a great show for 1 season, only it ended on a horrible cliffhanger unfortunately. But it's the only TV show on network TV I've seen come close to the comics I used to read. The character is on DC Legends now which made me think of it. I've had a friend for 35 years we call the curmudgeon. He'd probably be less of one if he read some comic strips. Not familiar w/ the comics guy, but I may have to check it out for old times sake, riffing on Family Circus should be pretty easy though, it practically riffed on itself. @rjejr My apologies for transferring my anger on to you. That wasn't my intent, but obviously that was bound to happen, seeing as I already knew you aren't one of the gun-toting idiots either, so it was more or less a given that we would agree. I'm not opposed to actual, normal hunting with regular rifles/guns, as long as it serves a purpose. Over here, it is done to prevent overpopulation of deer, wild boar, rabbits and geese, and because it's done by government-regulated institutions, there's basically only rangers and foresters doing the job, and the odd professional hunter here or there, depending on the size of the overpopulation. Most of the meat is then offered to restaurants, or sold to bidders. No fathers teaching their sons the "beauty" of the hunt over here. Unless their dad is a forester or ranger, of course, but then they will at least be taught correctly, and that it's about a necessity. But overall, I agree with your view. Good nuance too, but then again: that was kind of the point of me saying how our ancestors' point of view and mindset was vastly different from ours. They would never be able to comprehend us not living in semi-wilderness anymore without the dangers of wild animals and/or the indigenous people who's country we stole, or there not being any major wars on home soil, let alone people living in skyscrapers. Civilian militias are mostly raving idiots nowadays, and the other idiots getting guns and making hundreds of casualties on a yearly basis surely never was their intent when writing down their amendment. As for OTT: we've got the main services over here, so Netflix, Amazon, Apple TV and some smaller, local initiatives, so yeah, I am familiar with it. Not using any of them, though. I'm more of a traditional guy and I like my regular shows and TV personalities, like I already mentioned before. Oh, and don't worry about bothering me with your internet speed adventures: I actually find it interesting, so you're not going to run the risk of boring me with it. I still think 20Mbps sounds horribly slow, though. Especially considering multiple devices connected and HD/UHD/4K services, and also because I've already had 100Mbps for multiple years already, so I'm very used to that, and even now, sometimes YouTube videos buffer longer than they should, let alone full HD movies. @ThanosReXXX We'll have to wait on internet speeds, they seem in no rush to downgrade me, still have my tv channels and dialtone. Possibly they are wating until next week since we pay in advance over here and they would owe me a weeks worth of refund, about $40, which is more than the $35 new bill, so they would theoretically owe me $5 next month. Probably better for them just to let it play itself out for a week. Or, ya know, bureaucracy is slow. They actually called - on my now dead line - and emailed me yesterday asking if I wanted to upgrade from 100 to 200 for $5 more per month. There's a joke about right hands and left hands in there somewhere. And while agree w/ you 20 may be too slow - only 1 way to find out though - I'd never pay extra to go from 100 to 200. Even 4k tv only needs 25, so I'd need at least four 4k tvs to need over 100. Did I give you this link already for HD download speeds? Really only need about 5-8, so 20 should get us 2 HD streams easily. What's funny is the Vudu Speedometer maxes out at 20. Though in fairness I've always been a bit confused by download speeds. I think the industry has kind of settled on Mbps - megabits - though it could be megabytes. But whatever they've chosen i think it is consistent now, so where Vudu talks about 2250 or 4500 that would be 2.25Mbps or 4.5Mbps. So according to them I should be golden at 20. I've always measured in GB download time myself. My download speed per GB has come down from 20 minutes to 10 minutes to 5 minutes. I'm guessing 5 is me now at 100Mbps, 10 was when I Was at 50/60 (company was never sure) so 20 would have been 25Mbps. Or maybe that was 10Mbps? PS3/4 were always faster than Wii U. So anyway I have a few big PS+ games waiting to download on my PS4 so I can see what my new 20 speed looks like. Not the most scientific method, but I don't live in a lab, I live in real life, and that's how I measure my real life, in GB download speed. And 20minutes per GB is fine if that's what 20Mbps gives me. Takes all night for a 30GB game, but thats' when I download those, while I sleep. But in all seriousness: my current download speeds, for instance on torrents of movies and series, is around 6 - 8 minutes for 4GB, and that is on average: sometimes I download with 9MB/s. When I got my Xbox One S after Christmas, I had about 120 games in my "ready to download" list, courtesy of the free Games with Gold initiative. I ultimately chose 70 out of the entire list to download, and that was done in around 1,5 day. And now, with every new game released on Games with Gold, I download it while I'm playing another, and most of them are reeled in within 15 min. (download speeds go down a bit when playing simultaneously for some reason) but it's still fast, and I wouldn't want to have it any other way. Like I said: I'm used to my current internet speed, which is why 20Mbps sounds so slow to me. That would mean that the same amount of games that I have downloaded back then, would have taken me almost an entire week. That would NOT have been acceptable to me. And I'm just by myself, having the entire internet for just me. When I imagine having a family and everyone leeching off of that connection, that would certainly have it's affect on bandwidth per device. Good luck on the dental adventures. My teeth aren't in the best condition either, but the necessary funds aren't there, so I just take care of what's still there (that actually makes it sound worse than it is, while most of my teeth and molars are still there) and I'll go to the dentist some time in the next few years. Not because of a fear or hatred of pain, though. I have a VERY high pain threshold, thanks to good genes and martial arts. Most of my dental procedures in the past were done without an anesthetic, or only in the final stage of the procedure, if I REALLY couldn't stand it anymore. The consideration over here is also cost: we have health insurance that covers most dental procedures, but not the anesthetic, so a couple of simple injections could cost anything from 10 to 40 euros per visit to the dentist, and that is an added cost that most people dislike paying. I dont' notice my gap too much b/c the tooth they took out was bent so far backwards, maybe 30 degrees, you could barely see it anyway. I notice it more now b/c the gum has receded so much my gum is missing more than I notice the tooth missing. Cost me $52 for 1 new cavity to be filled and one old metal one replaced, they use epoxy resin now which is nice. I did get 2 shots of Novocaine w/ a big needle. I'm supposed to go back in 11 days to get my last 2 metal fillings replaced. And they are pushing me for a full blown gum treatment, scaling and a bunch of shots, but I'm not so keen on that, I really hate anyone being in my mouth, I can't really breathe thru my nose so I'm nervous the entire time. My WiFi hotspot service wasn't working, my phone said I needed an account. Hopefully it's just a glitch, no one I spoke to - 3 different people - mentioned anything about no WiFi w/ their 20 service. Nothing about it on their website either. So I'm hoping it's just a glitch, I actually use their over 1.5 million hotspots quite a bit while I'm out and about, it's the main reason I haven't switched to the better Verizon FIOS service yet. If I've lost hotspots it's time to switch. The more I look at their website it just must have been a glitch from me changing speeds. "6 - 8 minutes for 4GB, and that is on average: sometimes I download with 9MB/s." 2 minutes per GB? I've never been that fast, I'm pretty sure 5 minutes, maybe 4 minutes tops. Well speedtest still says I'm at 100Mbps per second, might as well go see and stop typing. OK, real world, my PS4 says 73Mbps. Probably b/c my cable modem goes to a company supplied router, then that router goes to my router over a 50' ethernet cable, then it goes into my PS4 from that router, so that's 50' of cable plus 2 routers it needs to travel thru. So anyway i had an 5GB download say it need 7 minutes, but a larger 40GB download said 60 minutes. Now it's only just started, so that estimate could be wrong, but it is in line w/ your numbers, 1.5 minutes per GB. Wow that's fast, I'd never need to pay extra for 200, that's nutty fast for me. On the happy side for me, if I can get 1GB in 1.5 minutes at 100, my arithmetic says 1GB in 7.5 minutes at 20. (Not sure why, 100/5 vs 20x5 maybe). But anyway, I'm great w/ 10min per GB. Even 40GB would take 400 minutes, that's ~7 hours, while I sleep. And that should be plenty fast for streaming. I haven't pirated anything in a few years, too easy otherwise these days, so I'm not worried about that. @rjejr That's a lot of procedures all one after the other. Sounds like you haven't been there for a while? For me, it will probably be the same: root canal, two missing molars (one on each side, upper jaw) and I also have a couple of old metal fillings that need to be replaced by shiny, nice white ones... But I'll go when my wallet allows for it. Right now, there's other stuff to take care of and pay for, so that takes precedence. That 73Mbps for console game downloads sounds about right. On my Xbox One S, it's anywhere between 48 - 89Mbps, depending on either the time of day or the provider of the game, so it more than likely also depends on the uploader (don't know if they all come from one and the same server park or not), but for anyone to be able to get downloads at full speed, your connection should obviously be able to make use of their upload speed/bandwidth as well: if they're pushing stuff towards you at a 100, and you only have 20, then that's obviously going to be throttled/queued, since you'll only ever be able to download as fast as YOUR connection allows you, regardless of the speed of the uploader. But hey, as long as you're okay with it yourself, then that's the most important, seeing as you're the one that's going to make use of it, not me or anyone else. Maybe I'll get it. Is it a good game? @ThanosReXXX As with most things it comes down to money with me, and spite. 20 for $25 or 100 for $65. Plus $10 for the modem until my new one comes in the mail next werk, it's on a slow crawl from California. So 100 is by far a better deal, 5x the speed for 2.5x time the price. But it's still 2.5x the price. They took away 25, 30, 50 and 60, all of which would be better than 20 but cheaper than 100. But now it's 20, 100, 200, 300 or 400. Even you would probably be fine with 200 and not pay more for more, they don't need those higher speeds for home, just business. Not saying they need 30, 50 and 60, but 50 for $35 or $40 would be the sweet spot for most. Which is why they don't have it. That's where the spite comes in. It's almost a bait and switch, 3 of their customer reps try to talk me out of something they offer. If it's too slow give me my 50 or 60 back, that would be perfect. So we'll see how 20 goes, then upgrade as need be. As for the chompers: I never floss or rinse. Just a decent brushing of at least 2 minutes and the occasional toothpick usage here or there. Underrated? Didn't this game sell over a million copies? @ThanosReXXX It'd be interesting if they did a splatoon and de blob crossover, it may not have to be a separate game, it could be DLC like the octo expansion - but if they make a new splatoon game it couldn't be like the first or second game, since that'd be very difficult to manage. So maybe it'd could be a local co-op shooter (like splatoon), a 3d platformer (like de blob) or possibly a mix of both! Anyway it'd be great to see 2 great franchises mix like that.